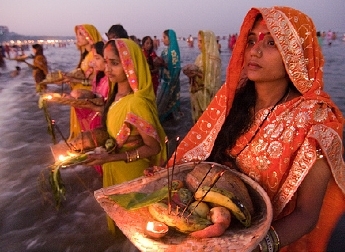 Chhath Puja is the auspicious day when all Indian Hindus offer thanks to the Sun God. During this festival, people gather at the River Ganga to bathe in its sacred water, pray and make ritual offerings to the Sun God. Chhath Pooja is an attractive festival with its impressive display of colorful clothes, music, singing and extravagant rituals. Chath Puja is mostly celebrated in the months of October and November, immediately after the six-day festival of lights known as Diwali. Chath Pooja lasts for almost 3 days. Chath Puja was celebrated mainly in Bihar, Uttar Pradesh, Uttaranchal and Jharkhand. However, now a days, it is celebrated almost everywhere in India. 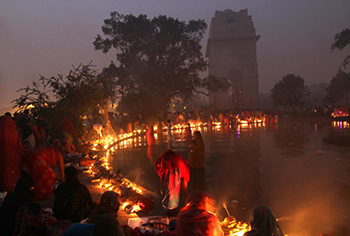 The main festivities takes place on the banks of the River Ganga and at the Sun Temple of Baragaon, Nalanda, in Bihar. On the day before the festival of Chhath Puja, Hindus gather on the riverbanks and cleanse themselves in the water of the River Ganga. After cleansing, some amount of sacred water is taken as offerings during the festival. People fast throughout the day before the Chhath Puja. The fast is followed by special prayers at the home. The family is then served a festive fare of freshly harvested rice, puris and fruit such as bananas, coconuts and grapefruit. A strict 24-hour fast is observed by not even consuming water on the second day of Chhath Puja. The senior women of the household cleanse the cooking utensils as part of the ritual preparation of offerings for the Chhath Puja. At sunset worshippers takes these offerings to the banks of river ganga. When the sun sets, the participants pay homage to the Sun God. Further celebrations take place at nightfall, when sugar cane stalks are offered by laying it out on temporary canopies as a tribute to the god of fire. Worshippers return to the riverbank to pray to the rising sun; which is the most important ritual in the ceremony of Chhath Pooja. Following prayers and after the purifying bath ritual, the fast ends by offering Prasad to the Sun God. While the chanting of the Rig Veda Gayatri Mantra to the Sun God is performed, offerings are shared with families, friends and fellow worshippers. For sending invitations to all the family and friends, you can use an online invitation tool like Yoovite.Com. Just select a template of your choice and enter the details before sending them to all your friends. You can choose the email addresses from your mail address books. The best thing about online invitations is that you can send them all at once. With the RSVP option, you can also know in advance the number of guests attending the party. This way, you can arrange everything according to the number of guests. Chatth Puja parties will also have several kinds of delicious recipes included. Rasiao-kheer (rice delicacy), puris and fruits like bananas are the most popular delicacies offered for Chatth Puja Celebrations.